this was, of course, after Jeff Zucker blamed the president. Last edited by Kapture1; October 25th, 2018, 12:56 PM. Yeah Imma go out on a limb and say Avenatti might not be the front-runner for the Dem nomination. He may have just gotten more popular on the Alt Right Grifter circuit though!! I swear he might be getting a paycheck from the President. that is a legit possibility at this point. The perp has been christened the "MAGAbomber" by law enforcement. 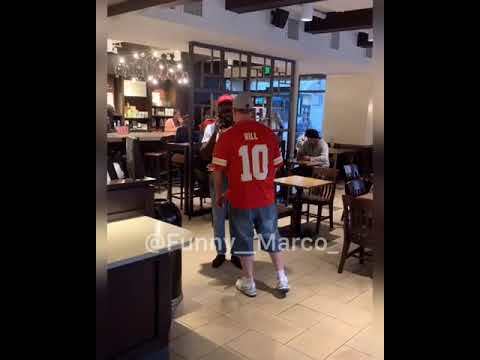 It seems going out to Starbucks for coffee in a MAGA hat is enough to get a black man assaulted. Make this idiot famous. NBC News also found other apparent inconsistencies in a second sworn statement from another woman whose statement Avenatti provided to the Senate Judiciary Committee in a bid to bolster Swetnick's claims. According to the second woman's declaration that Avenatti provided to the Senate Judiciary Committee, she said: "During the years 1981-82, I witnessed firsthand Brett Kavanaugh, together with others, 'spike' the 'punch' at house parties I attended with Quaaludes and/or grain alcohol. I understood this was being done for the purpose of making girls more likely to engage in sexual acts and less likely to say 'No.'" The statement also said that Kavanaugh was "overly aggressive and verbally abusive to girls. This conduct included inappropriate physical contact with girls of a sexual nature." But reached by phone independently from Avenatti on Oct. 3, the woman said she only "skimmed" the declaration. After reviewing the statement, she wrote in a text on Oct. 4 to NBC News: "It is incorrect that I saw Brett spike the punch. I didn't see anyone spike the punch...I was very clear with Michael Avenatti from day one." When pressed about abusive behavior towards girls, she wrote in a text: "I would not ever allow anyone to be abusive in my presence. Male or female." Shortly after tweeting out the woman's allegations on Oct. 2, Avenatti confirmed to NBC News that it was the same woman interviewed by phone on Sept. 30. But when questioned on Oct. 3 about the discrepancies between what she said in the phone interview and the serious allegations in the sworn declaration, Avenatti said he was "disgusted" with NBC News. At one point, in an apparent effort to thwart the reporting process, he added in the phone call, "How about this, on background, it's not the same woman. What are you going to do with that?" After NBC News received text messages from the woman refuting some of the claims in the declaration, NBC reached out again to Avenatti, who defended the declaration. "I have no idea what you are talking about," he said in a text. "I have a signed declaration that states otherwise together with multiple audio recordings where she stated exactly what is in the declaration. There were also multiple witnesses to our discussions." He sent a follow-up message moments later: "I just confirmed with her yet again that everything in the declaration is true and correct," Avenatti said. "She must have been confused by your question." Roughly five minutes later, the woman sent a formally-worded text backing Avenatti. "Please understand that everything in the declaration is true and you should not contact me anymore regarding this issue," the text read. But when reached by phone minutes later, the woman again insisted that she never saw Kavanaugh spike punch or act inappropriately toward women. She said she's "been consistent in what she's told Michael." In a subsequent text on Oct. 5, she wrote, "I will definitely talk to you again and no longer Avenatti. I do not like that he twisted my words." "I do not like that he twisted my words," one woman says of lawyer Michael Avenatti. The U.S. economy grows at a faster-than-expected rate in the third quarter as inflation was kept in check and consumer spending surged, according to Commerce Department data. Two more packages sent from the MAGAbomber intercepted, this time to U.S. Senator Cory Booker and James Clapper. His days are numbered. DNA acquisition has reached an insane level. In a perfect condition, trace DNA can be obtained obtained from a 2mm segment of a single line from a fingerprint (body oil). Unless he really knows what he's doing, he'll leave something that can confirm/absolve a suspect. There's also the possibility of security cam video field of view that might capture suspect mailboxes from nearby establishments. The adhesive labels can be identified to manufacturer by chemical composition which can point to distributors or possibly store chain. Same for the electrical tape, wiring and sealing tape. The timer attached should also provide some origin clues. Looking at pictures of the device received at CNN, you can see sloppiness in the application of the electrical tape. A serious bomb maker is REAL attentive to small details. This guy is an amateur, probably got the design off the internet. If he had only sent one or two, he might have gotten away with it. A dozen will provide a lot of forensic evidence that will narrow the search. His days are numbered. Hopefully his minutes are numbered.